Karp's Hardware Store: Long Island's only Hardware Store & Homebrew Shop under one roof! Long Island's Best place to buy ammo! Karp's Hardware and Homebrew is now a Federally Licensed Firearms Dealer! Ammuntion sales and FFL transfers (rifle & pistol: $40) available. Winchester, Remington, Blazer, Hornady, Federal, PMC and more ... Call, email or stop by for more information. 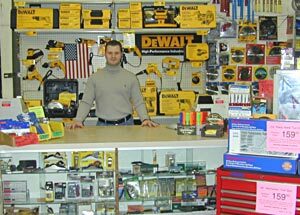 WE'RE LONG ISLAND'S FAVORITE HARDWARE STORE! We know you'll be glad you came. We can show you how to fix your leaking shower faucet, re-grout your tile, replace a worn electrical device, re-seed your lawn, or any one of a thousand other chores. Plus, count on Karp's for the best quality deck stains, house paint and basement waterproofing, with expert advice on how to use it all. We can even teach you how to juggle! Besides the obvious stuff, like we sell supplies for homebrewing beer and wine, ask yourself these questions: Does your hardware store stock nearly 400 different drill bits? (386 to be exact). Does your hardware store stock welding supplies? Oil burner parts? Snow sleds and snowboards? Does your hardware store stock thirty-six sizes of hole saws? Does your hardware store care enough about you to stock 43 different padlocks? Or metric screws in fine thread? How about over 100 different types of sandpaper? We stock an assortment of Reddy Heater parts including ignitors, rotors, filter kits, safety switches and nozzles. These parts have become difficult to find since Desa has gone out of business. Call us for up-to-date availability. part # examples: PP200 MP4. PP216 MP4. PP203 MP4. PP204 MP4. PP208-MP4. PP214-MP4. We have oil burner nozzles, filters, strainers and electrodes. So even on Sundays you can get your oil burner up and running. Just stop by Karp's for the parts you need. We stock the Forney brand of welding rod and accessories for mig and stick welders. We're the only place in the East Northport area to buy Mig tips, welding rod, steamfitters hats and other welding accessories. Karp's stocks the Diamond Sure line of porcelain tile drills. From 1/8" all the way up to 3", we have the drill for your hardest porcelain tile. Porcelain tile cannot be drilled by ordinary masonry or tile bits. You need the diamond edge of the Diamond Sure bits to make a fast clean hole in porcelain tile. Long Island's best selection of porcelain tile bits is only at Karp's Hardware. Poppytool's Safe Grip canvas drop cloths in stock! Currently advertised everywhere on television and in print, these remarkable slip-resistant drop cloths are making painting projects both easier and safer. Professional painters use them, why shouldn't you? I'm sure you get the point. We are special, and so are our customers. We're located in East Northport, New Yorkthat's on the north shore of Long Islandand we're open seven days a week. Of course we can UPS your order, but it's way more fun to come and visit. So far, we've had visitors from as far away as Korea, Argentina, Columbia, Englandand even New Jersey! Click here for driving and Long Island Railroad directions. We regularly have customers visit the store from Manhattan (the world's greatest city). We are easy to reach from NYC, our store is located a few feet from the Northport Train Station. © 2002-2014 East Northport Hardware, Inc. All rights reserved.